Today will be a dish of Asian cuisine. 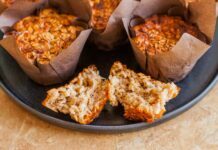 Bright, delicious, easy to prepare - all as I love. 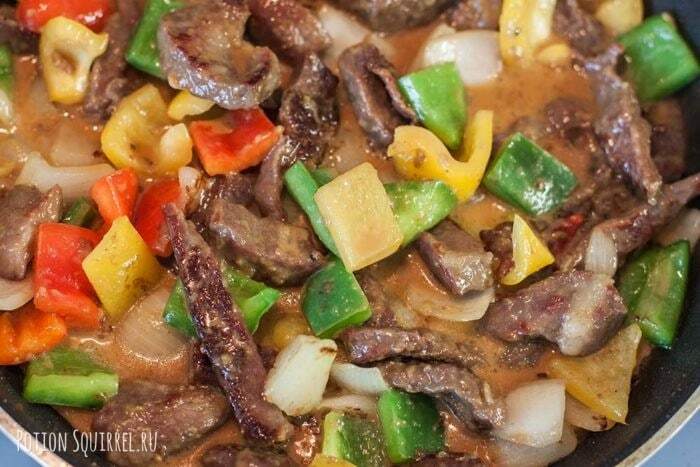 Melted in the mouth pieces of meat in a luxurious spicy sauce with crispy vegetables - that's what Mongolian beef is. 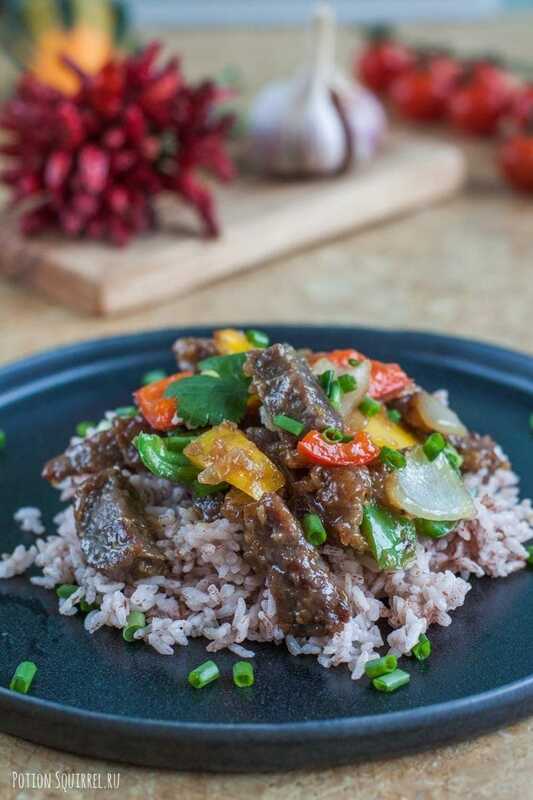 The recipe combines mouth-watering Asian flavors and spicy flavors with a hint of chilli spiciness. Comes great with a portion of white rice. 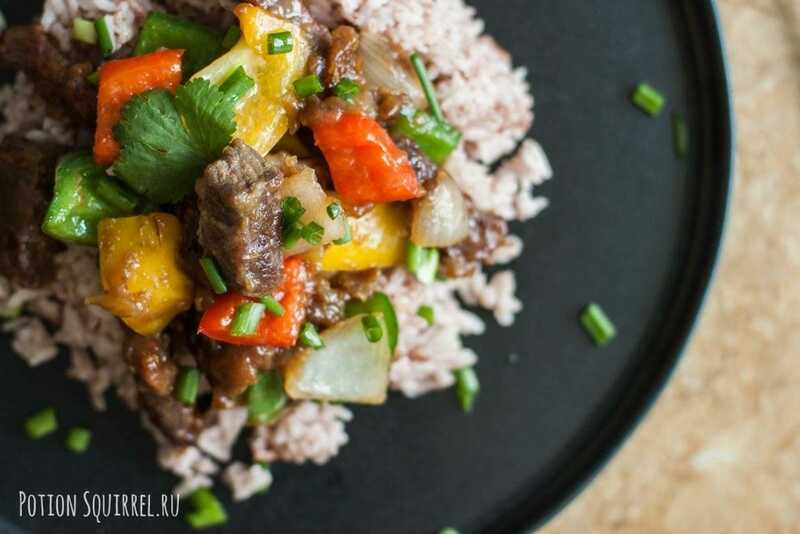 Mongolian beef in a spicy sauce with boiled rice. 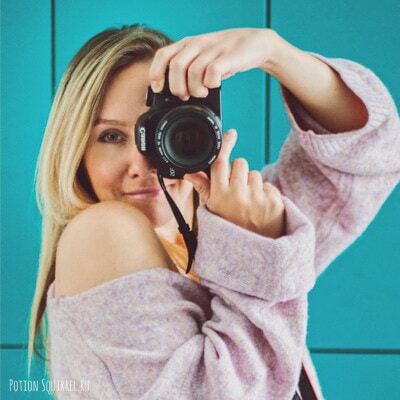 If you are not with me the first day, you noticed that I love to learn the history of the origin of recipes of dishes that I share. About Mongolian beef also figured out something. 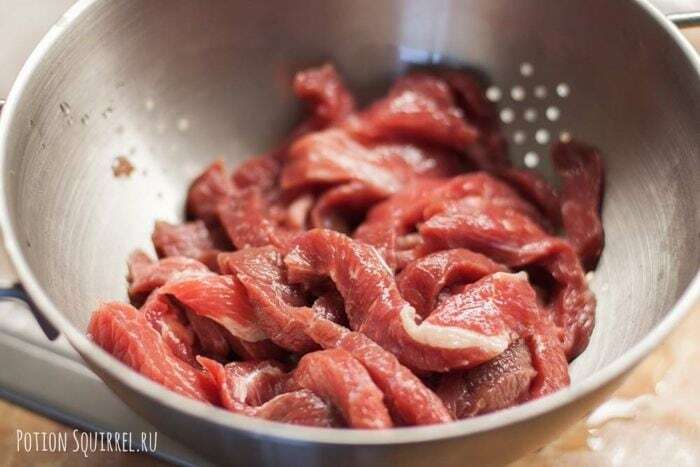 Name beef in Mongolian (mongolian beef) can be misleading, send you mentally during the reign of Genghis Khan, but in vain. 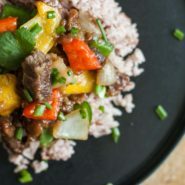 The recipe is from the Chinese island of Taiwan, and came up with it not so long ago. It combines classic spices (soy sauce, rice vinegar, ginger) and cooking methods (wok frying) typical of Chinese cuisine. The highest popularity of the dish has become in North America and Australia, where it is offered in many Chinese restaurants. 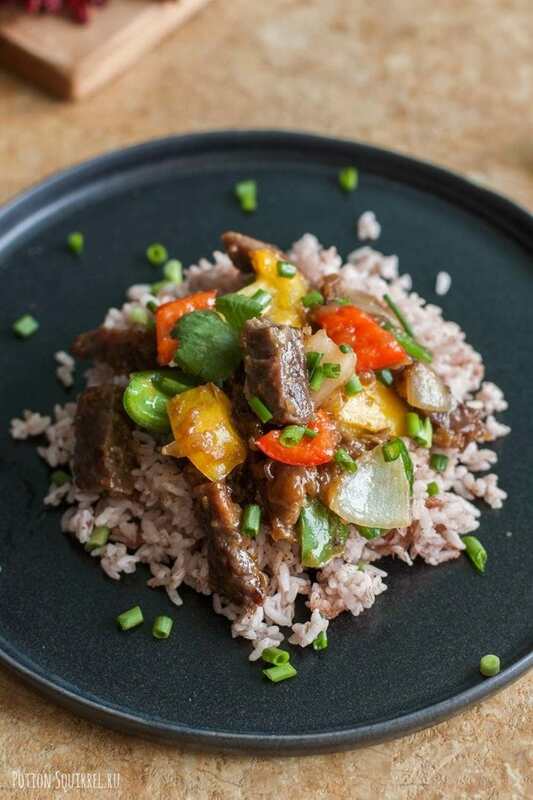 Mongolian beef is cooked from beef brisket or pike with vegetables and a special sauce. Traditional spices are ginger, garlic and hot pepper. Although the recipe is chili, the dish is not spicy. Always served with rice noodles or boiled white rice. The dish is not complicated. 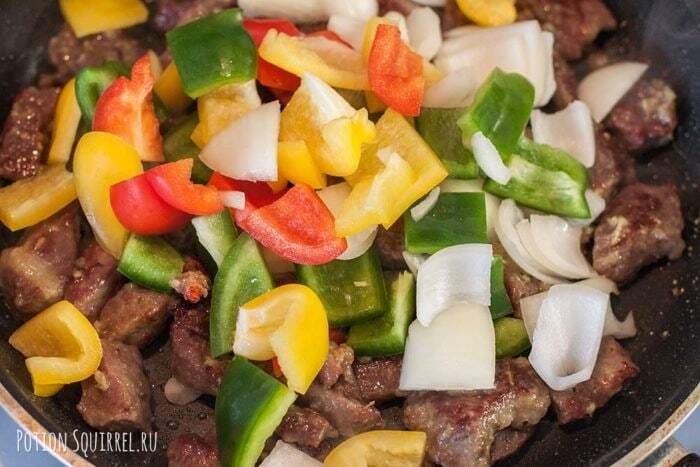 Meat marinated quickly, just enough 10 minutes. 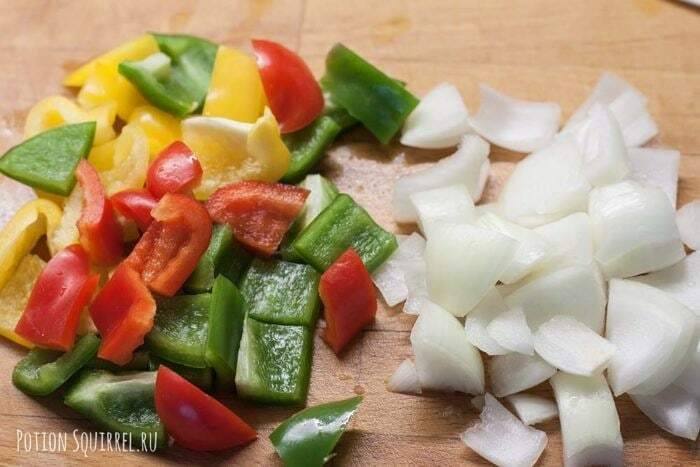 Of the most interesting vegetables are the Bulgarian peppers and onions. They fit perfectly into the overall picture, but do not try to interrupt the taste of meat with sauce. I tried adding celery, carrots and mini corncobs - too bright for my taste. 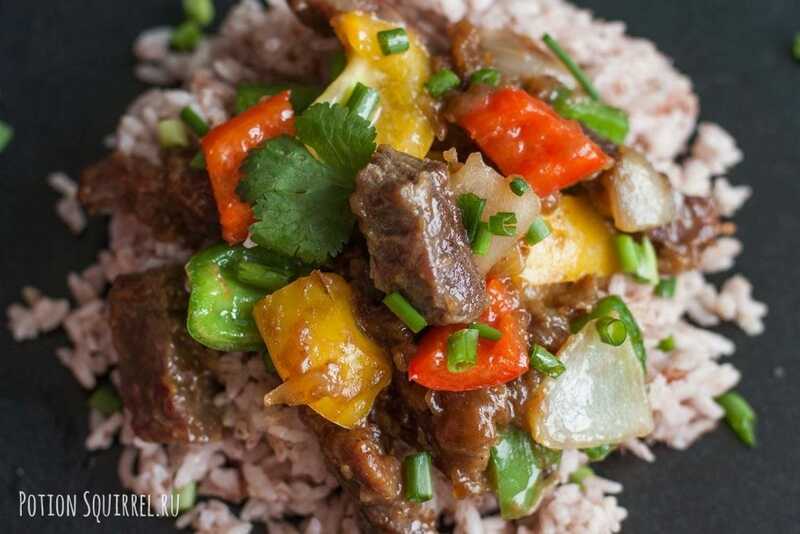 For the classic Mongolian beef sauce, mirin (sweet rice wine) or oyster sauce is required. Replace these hard-to-reach ingredients with rice vinegar and powdered sugar. Get the same savory sweet taste. Mirin and oyster sauce can be replaced with rice vinegar and powdered sugar. Vegetables should be slightly stewed! Do not fry them for more than a couple of minutes, they should crunch. 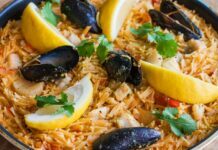 Leave on the fire longer, and the dish will lose in taste, will look less appetizing. Finally, I'll tell you about the meat. It is not necessary to take beef brisket or flake. Prefer fillet or tenderloin as the most tender parts of beef, best suited for frying. To ensure that the meat is tender, I will tell you how to soften it. We use soda. Baking soda is a secret ingredient that allows you to soften small pieces of meat in a short period of time. 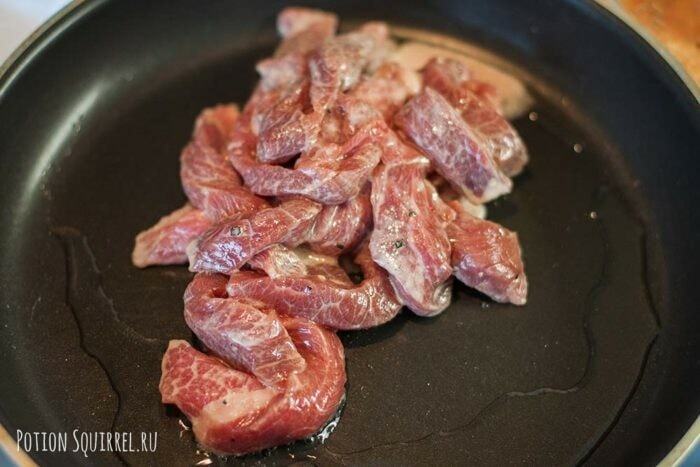 This technique is often used in Chinese dishes to make cuts of beef extremely tender and easy to chew. Baking soda creates an alkaline environment on the surface of the beef. This reduces the ability of the protein to bind during preparation, making it more tender and juicy. 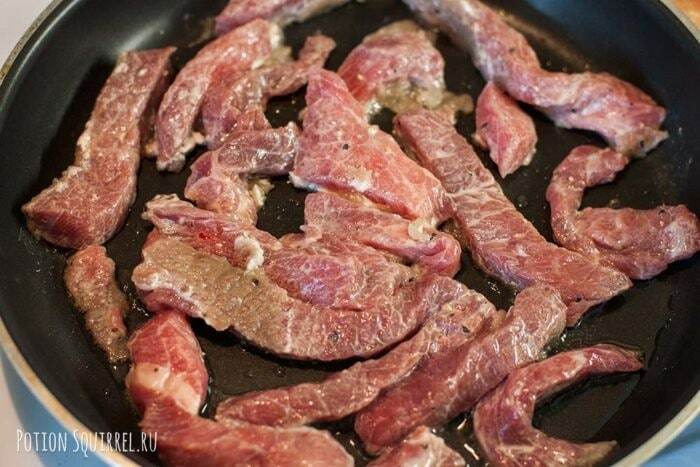 Beef cut into thin slices 1x3 see. If you use marble, ignore the step with soda, it is only for hard meat. Dissolve 1 / 2 tsp. soda in 20 ml of water. 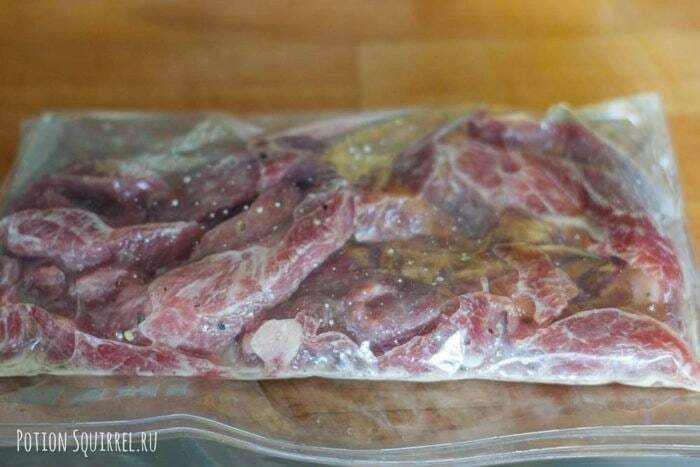 Put the meat in a bag, pour soda solution, extract the air as much as possible, close tightly. 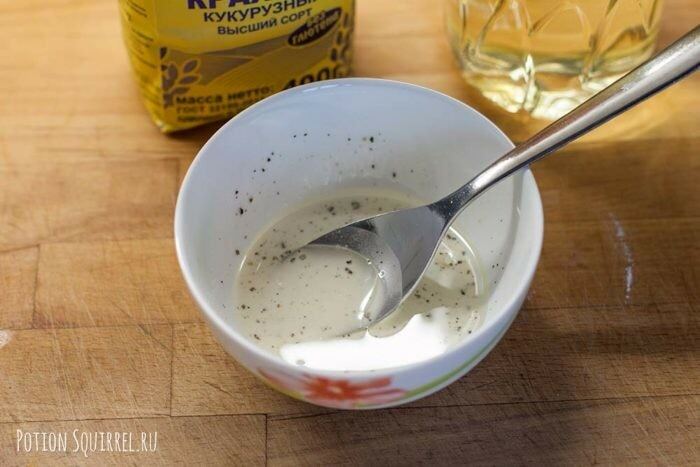 Leave in the refrigerator for a while from 30 minutes to 1 hours depending on the rigidity of the meat. 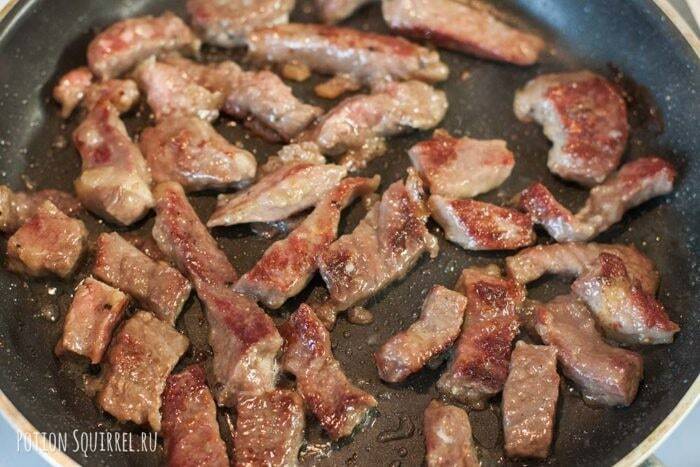 An hour later, get a bag of meat, put it in a colander and rinse easily from soda residue. 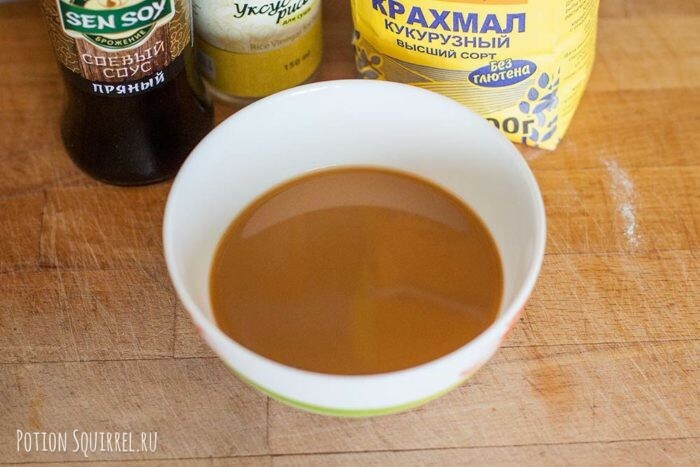 In another bowl, mix soy sauce (2 tbsp), rice vinegar (1 tbsp) and 1 tsp. starch, diluted in 20 ml of water and 1 tsp. 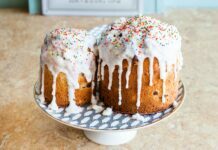 powdered sugar. Put on a strong fire pan. 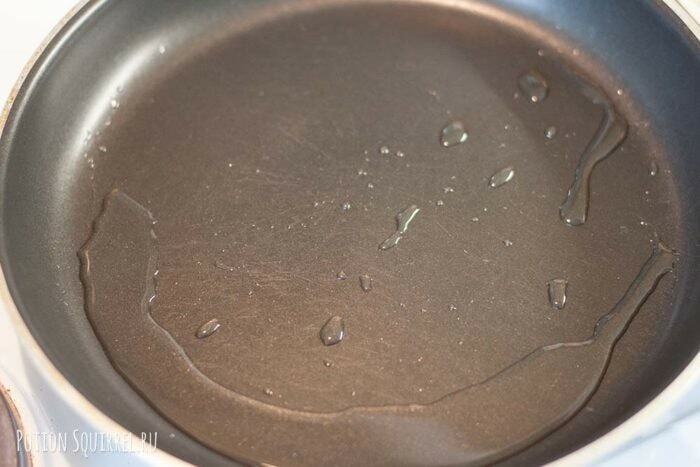 Ideally, use wok, but I do not have it, so I cook in a conventional frying pan with the thinnest possible bottom. As soon as the pan heats up, add 2 st.l. vegetable oil. Next put the beef. Fry until crusted. 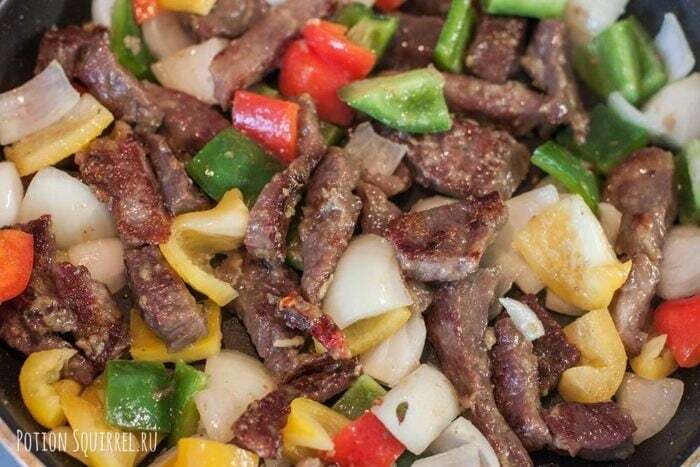 Constantly stirring with a spatula, fry beef for a total of 8-10 minutes. 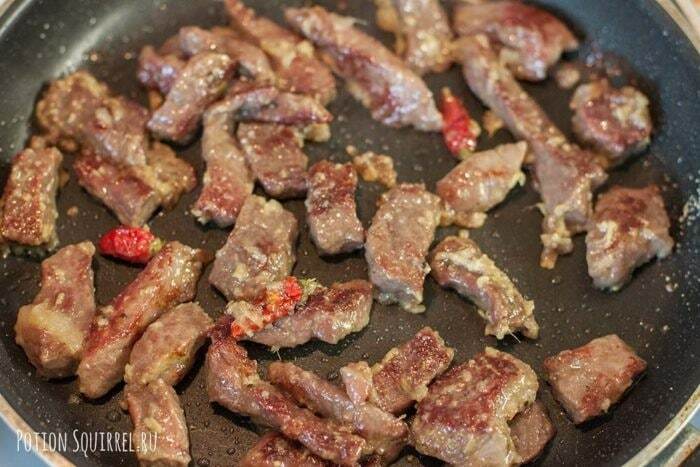 Throw dried garlic, grated ginger and chili peppers to the beef. Fry another 1 minute. Slowly pour in the sauce, stir until thickened. This should take no more than 1 minutes. Garnish with rice is best. Serve with green onions.